I just wrote about my easy summer wardrobe, and here I am, putting it on display. It is easier for me to have simple style formulas, especially for the non-layering season. My lifestyle and wardrobe is loose and light since retirement, although I am Not Dead Yet. I still have adventures and try to stretch my range every day. My not-skinny jeans are by GAP (similar) and they are lovely to wear. I think they have now shaped themselves comfortably to my form. On top is a linen blouse (sim) by crunchy granola brand FLAX. I love it, and no, it doesn’t need ironing (says the woman who doesn’t own an iron). I’m wearing old Anne Klein platform sandals (sim) and a pretty bead necklace, made by a friend. I can go anywhere and feel good. Almost anywhere, not to meet the Queen : >. I love this look, Patti. It looks great on you. I have several linen tops but don’t you just hate how they vrease? I love this look and it looks great on you, Patti! I have several linen tops but don’t you hate how they crease? I love a look that feels natural – and this is totally it. You look both at home in your skin and in your clothes which is always how it should be. I love those jeans on you Patti, what a great effortless look. I love to wear linen in the summer, nothing better. Thank you for hosting. Casual chic perfection Patti…I absolutely love this look on you. And don’t you just love it when a pair of jeans becomes one with your shape?! Love your look! I’m a huge fan of jeans for comfort. Hooray for retirement…I’m looking forward to getting there before long! Oh man, you don’t own an IRON?!!! I’m sweating just thinking about it. I don’t use mine much, but I need to have it to feel calm. Hahaha. LOVE your linen with your jeans. Linen feels so elegant at all times. Great photos, Patti. Thanks for the link-up. You look amazing in jeans Patti! Pretty sandals and I love the look of linen. Being that you dont have to iron your shirt, even better! I use Downy’s wrinkle releaser… no iron either. Enjoy your week! Great outfit! I love that necklace! Love the red lipstick too! Such an easy breezy look. I love linen, and I have several pair of pants that are the beachy, flowy, type. Thanks for telling me about your top. I love it’s look. Thanks for hosting Patti – looking lovely as always! Love this easy breezy look Patti! Come check out my latest collab with LA-based TOBI – I’m sure you’ll love it! Happy Monday!! You look so great in these jeans! Fantastic relaxed look that is still very put together. I see you are ready for summer, dear Patti. You always wear the best shoes. Thank you for the fabulous link up. Nice and comfortable casual look, Patti! I like linen pieces for summer too! A lovely casual look Patti and such a pretty necklace! Happy Monday and thanks so much for hosting! I love the ease and comfort of your outfit. You look marvelously cool and stylish. love how you cuffed your jeans!! so cute. So fun and totally chic!! You’re a doll!! This looks so bohemian and relaxed. You need to wear jeans more often! They look fantastic on you! I’m happy you didn’t decide to come and visit now…tonight it is going down to zero. (What the…?) I have no idea what is happening with our weird weather this year. I’m glad I haven’t put away my winter clothing. What a lovely chill look! You look wonderful, Patti! Thank you for the link-up – I always have so much exploring. ahh, so cool. Linen is my fav too. But geez, it’s only 40 where I am. Oh Patti, I am so envious of your FLAX top! I used to wear FLAX clothing years and years ago and haven’t owned a piece of it in well over a decade. I would love to have some pieces now! So cool and casual and fabulous! I love this top paired with jeans! Great summer blouse…and thanks for the link up Patti! Great casual look, Patti, linen is so easy to wear and perfect for high temperatures! I love this outfit on you! It looks so effortless, comfortable, yet stylish! You look happier under the tree this week than the last time you were there. Simple and effortless, that’s my recipe for summer outfits, too. And you look really cool in this linen top and jeans combo. I love the necklace! Patti, I believe this is the first time I’ve seen you in jeans. How wonderful you look. Very bohemian. 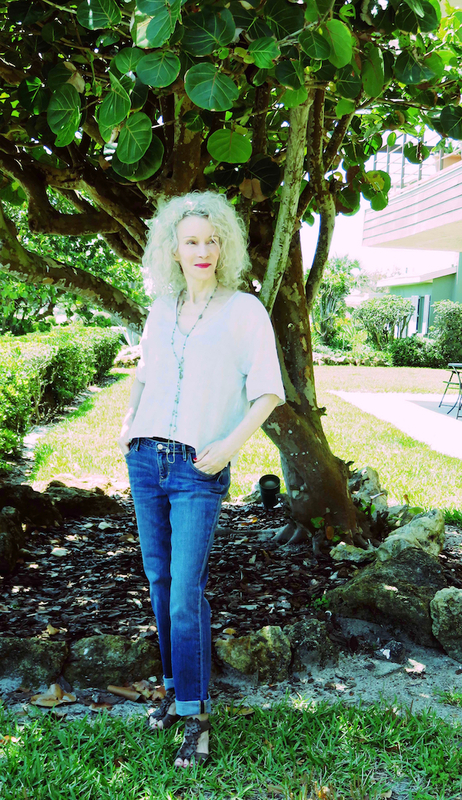 The top and your necklace work perfectly with your jeans and make a great, free-spirited story.